Lots of special features including: Foldout front cover with the beautiful matte coating. An inspiring and entertaining “Meet the Artists” feature article with some very cool artist portraits. A series of my own kapa-feel coordinating backgrounds throughout the book. An original Big Island Map. Even a cut-out folding greeting card. The 9MB file takes a few minutes to download and then you will be rewarded with the entire book full of high resolution images and stories. 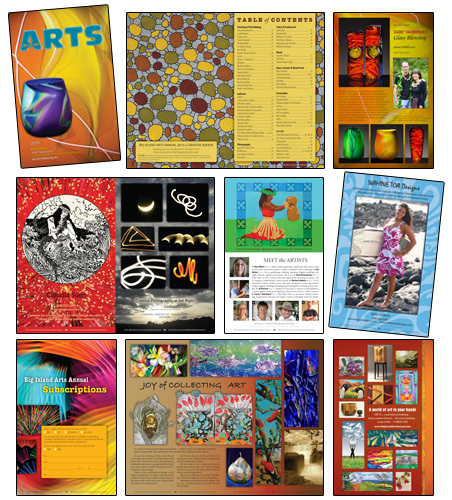 Below: Sample pages and “Meet the Artists” interviews from 2010. Keep scrolling down for highlights from the 2009 and 2008 editions, too. From JANUARY, 2010: What is in the heart and mind of an artist? Find out a lot in a little bit of time. These MINI “3” interviews helped mark the occasion of our third edition. Inquiries were made. 3-WORD ANSWERS followed. Fast fun. Enjoy! Behind the scenes I had developed a list of 14 questions from which the artists could choose three or more to answer. From those I shuffled and compiled. Artists are arranged in the order that I felt made the best flowing story. Patricia Missler: 1) Art is: life’s visual heartbeat. 2) Recently inspired by: my abundant garden. 3) Before making art, has been known to have: leaps of faith. Steven Pollard, Ph.D.: 1) I make art because: it pleases me. 2) Best ideas come: from letting go. 3) A piece begins: as colors flow. Kathleen Crampton: 1) Before making art, has been known to: make a mess. 2) Most recent inspiration: a voggy sunset. 3) I make art because: joy compells me. Claudia Suen: 1) Inspired by: other artists’ work. 2) Goal as an artist: to celebrate life. 3) Before making art, needs to: clean the house. Rani Denise Ulrich: 1) Chose favorite medium because: oils are sensual. 2) Best part of being an artist: seeing vision emerge. 3) Hopes her art will: encourage nature appreciation. Elizabeth (Liz) Miller: 1) Art is a: journey into unmanifested. 2) I make art because of: its unspeakable spirit. 3) Best part of being an artist: life dance participation. Deedee Bodine: 1) Knew she was an artist when: was born blue. 2) Always inspired by: mother nature’s abundance. 3) Before making art it helps to: be at peace. Hosoi: 1) Knew I was an artist when: papa showed me. 2) Goal as an artist: sharing with world. 3) Before creating, has been known to: collect road junk. Jennifer Schwarz: 1) Knew she was an artist when: life became art. 2) A piece begins: with a feeling. 3) Sharing her artwork: completes the process. Joy Nemiroff: 1) Makes art because: art focuses experiences. 2) Chose favorite medium because: fabric moves space. 3) Uses color to: hear its voices. Connie Firestone: 1) Goal as an artist: connect with people. 2) A piece begins: when it’s time. 3) And is finished: when it speaks. Rosemary Miller: 1) Uses color: to express life. 2) A piece begins: when daylight appears. 3) Knew I was an artist when: I was born. Rozemaryn van der Horst: 1) Knew she was an artist when: never knew it. 2) Biggest challenge: the work itself. 3) Get my best ideas: when I’m asleep. JoDee Schumer 1) Knew she was an artist when: eating a crayon. 2) Has most fun: creating with friends. 3) Hopes her art will: brighten a life. Mary Villaire: 1) Most recent inspiration: daybreak with mana. 2) Goal as an artist: learn from heart. 3) A piece is finished: with a blessing. Dux Missler: 1) Art is: gardening, cooking, painting. 2) Biggest challenge: the right attitude. 3) Makes art because: life is art. Anita Broennimann: 1) Uses color to: set a mood. 2) Gets best ideas from: listening to music. 3) Art is: magical, inspirational, controversial. Martina Stephens: 1) Art is essential because: makes us see. 2) Best part of being an artist: age doesn’t matter. 3) Biggest challenge of managing an art gallery: matching your market. JD Morrison: 1) Makes art because: it allows contemplation. 2) A piece begins: with good lighting. 3) Goal as an artist: to reflect nature. James C. Osterberg Jr: 1) Most fun I have as an artist: selling a painting. 2) Inspired by: Vincent van Gogh. 3) A piece is finished: when it’s happy. Diane Renchler: 1) Knew she was an artist with: her first watercolor. 2) Goal as an artist: to keep painting. 3) She’s happy: when she paints. Erich Broennimann: 1) Biggest challenge: finding enough time. 2) Chose favorite medium because: it is touchable. 3) I make art because: I enjoy creating. Patti Pease Johnson: 1) Best part of teaching art: seeing students aglow. 2) Chose favorite medium because: loves the fluidity. 3) Hopes her art will: lighten people up. Heather Alexis Morrison: 1) Most recently inspired by: this morning’s coffee. 2) Gets best ideas when: immersed in work. 3) Most fun project ever: co-creating this book. Dr Rodney Chang: 1) Art is a: way to be. 2) Recent inspiration: lava form expression. 3) A piece is finished: now or later. Ira Ono: 1) Knew he was an artist when: nospell, nomath, nowrite. 2) Before making art, likes to: swim, dream, garden. 3) Art is essential because: it saves lives. 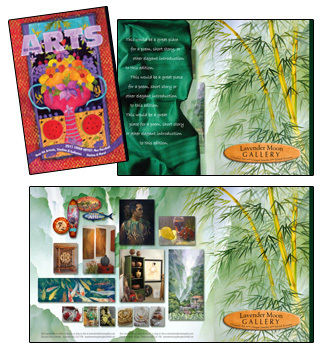 Below: Sample pages from Big Island Arts Annual 2009. 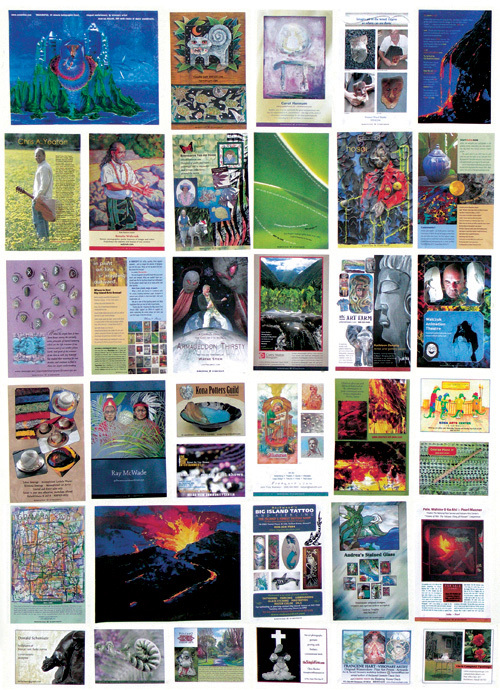 Below: 2009 Promotional postcard featuring advertiser pages. Below: A photograph of my studio with the pages taped to the wall so I could study them. I LOVE how the book turned out! Once again, many mahalos. It was great fun working with you. Aloha! I’m writing to tell you how wonderful your new baby looks! VERY impressive! Thank you again for ALL you do for us artists. I received an inquiry the FIRST DAY the book was out! I appreciate supporters like you and many others during these hard times. 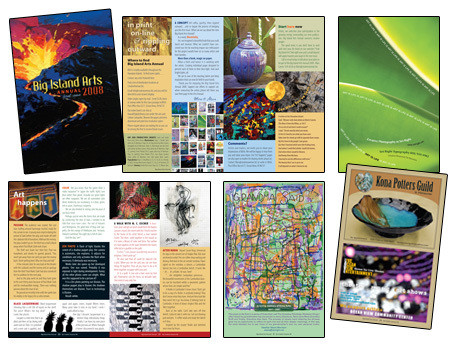 Last week a couple came in with the Big Island Arts Annual in hand saying “it directed them to this wonderful facility” and they were able to contact a couple of the artists too. Your publication works! You sent me the ‘moon shift’ email on Tuesday and I sold 4 paintings on Wednesday and Thursday so Thank You…You brought me luck! 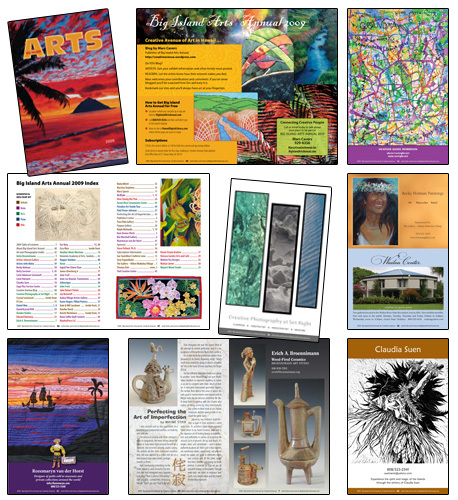 I am proud to be a part of the vision of the Big Island for the creative place that it is. Thank you for making it a reality for visitors to sense the variety and culture of our home. Alan’s writing and your presentation have inspired me immensely on an emotional and spiritual level. 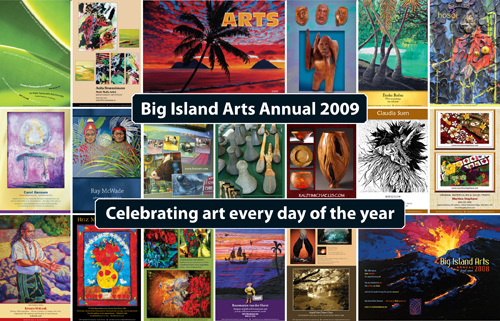 Mahalo for the beautiful incorporation in this issue of Big Island Arts Annual.